With many delightful courses, pure coastal breeze from the Atlantic ocean, great fresh gastronomy and fantastic weather conditions, Portugal is a Golf Bliss for most golfers. Missing the fairway traps sets up an uphill pitch requiring good length judgment. Another testing drive to set up an approach shot from the angle of the dogleg. Favour the right side with your second shot. A chance for a strong tee shot downhill. Still requires a good touch on the high flighted second shot. One of the world's great par-5 holes. Lots of ways to play it but all basically need straight measured shots. Choose your club and make a positive good swing. Not for the nervous! A well positioned tee shot to the corner of the left hand dogleg leaves an iron shot to reach the green. A testing and picturesque par-3 that requires a carrying shot to reach the green. 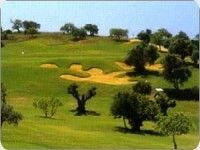 A draw shot round the dogleg or a lay up level with the fairway bunkers sets up a testing pitch shot. Look to see the direction of the wind because the carry over the trees needs the wind from behind. The second shot is deceptive to a long green. A sharp dogleg right requiring a precise drive and then an accurate mid-iron. Make a good carrying strike as it is better to be long than short. Reachable in two with the right wind. A testing green to hit with any club. A deceptive short-iron when you make a good tee shot. Can be reached in two, and if not, try approaching the green from left to right. Great downhill par-3. A good strike saves the player from a sandy fate!. 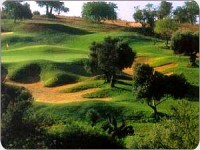 The bunkers and trees on the right of the fairway are to be avoided. Uphill short-iron plays long. Another test of shot making or more time on the beach! A true par-5, anything long and straight works on all three shots and will see you safely home.